On the occasion of the LH Forum which will take place in Le Havre from the 25th to the 27th of September, Arnaud Ventura, co-founder of PlaNet Finance will pilot this second edition. 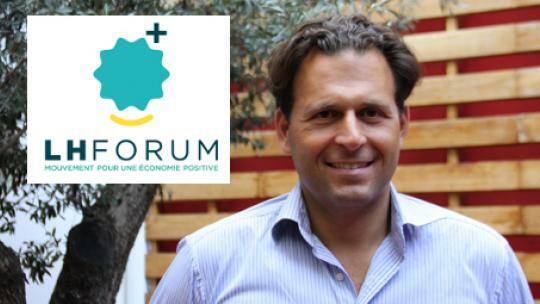 In a recent interview to the website"Regards d’entrepreneurs", Arnaud Ventura explained in details the meaning of "positive economy". Title your action “Movement for a positive economy” suggest that so far, the economy could only be negative. Why not simply have called it “the new economy”? What are the positive aspects of this economy? Economy and finance are often presented by their negative aspects in media, and especially at the moment. The economy is synonym of unemployment, inflation, drop growth, etc. Positive economy, aims to illustrate the fact that economy can also bring positive consequences for all of us and for the society. Beyond the use of those who work for that and the profit of those who invested money, the Positive Economy takes care of the long term stakeholder’s interests. Positive economy’s existence is not new, and it explains why we did not call it “new economy”, but it is not necessarily visible and recognized as a major component of the economy. The LH Forum(LH for “Le Havre”) takes place in Le Havre from the 25th to the 27th of September for the second consecutive year. During these 3 days of meeting between academics, public and privet actors, the word is given to managers of industrial groups. What place do you reserve for managers of SMB, small businesses, worker cooperatives, social enterprises and associations during this meeting? The LH Forum give voices to many economic actors as social entrepreneurs often in charge of a small businesses, SMB or cooperatives, or even representatives of large companies. The 2013 program gathers especially an equal part of representatives of large companies and of social entrepreneurs or managers of SMB/small business. What is the link between PlaNet Finance, organism of international microcredit, of which you are a co-founder, and the LH Forum? Do French entrepreneurs have access to this type of founding? If not, for what reasons? The group PlaNet Finance was born in 1998 with the objective to develop access to microfinance. During 15 years, the microfinance has been developed to become an example in a sector that creates values not only for investors but also for clients and all involved parts. Microfinance in emerging countries concerns mainly microentrepreneurs who doesn't have access to the traditional banking system. In order to help microentrepreneurs in the world, MicroWorld propose you to discover microcredit!